“In this time of gratitude, I want to give thanks to all of my valued customers. KB Staffing values your patronage and the confidence that has been placed with us. I also want to thank my talented group of employees. Their hard work and commitment is what has made our agency great. 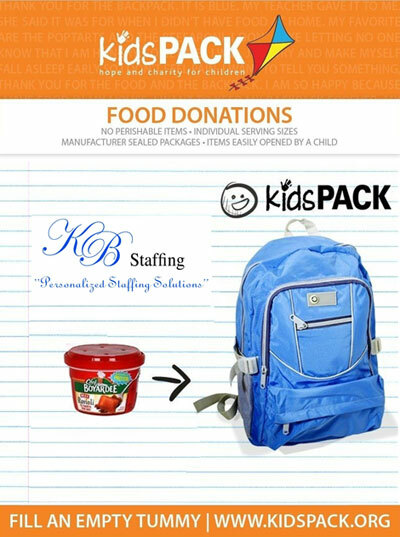 KB Staffing’s commitment to its community brings them up to the front line in the battle against child hunger. They have partnered with kidsPACK in providing packed food for children each Friday to sustain them through the weekends when they don’t get their subsidized school meals. They have already helped numerous children in the past year and have recently taken on the task of being a drop-off location for donations in Winter Haven. This allows KB Staffing to help more children and volunteer more of their time for the cause. What Are The Big Advantages of Using a Staffing Company for Seasonal Help?